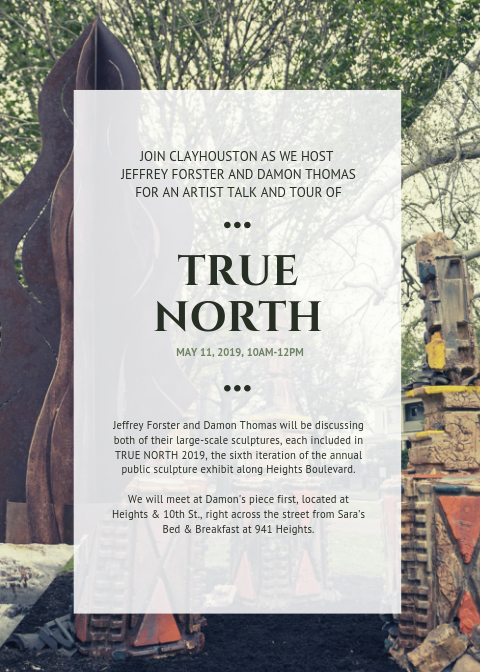 Jeff Forster and Damon Thomas will be discussing both of their large-scale sculptures, each included in TRUE NORTH 2019, the sixth iteration of the annual public sculpture exhibit along Heights Boulevard. Both Damon’s “Home Fire” and Jeff’s “North Space Ruin” in the 1800 block of the Heights are the first ceramic sculptures included in this annual outdoor exhibit since it began in 2014. All eight of the sculptures in TRUE NORTH 2019 will be on display through Dec. 15, 2019.